Decades ago, I hitchhiked across the United States, and along the way I stopped at the Grand Canyon. Yet while growing up I had seen so many pictures of it that when I first stepped out on the rim and looked down, I thought, “Oh. This looks just like the pictures.” It was cool, certainly, but a bit underwhelming to someone jaded by excessive visual foreplay. I thought about this a few weeks ago when I was in Guatemala. In the days of picture postcards, the most common images from Guatemala’s western highlands were of Maya women weaving, the colorful cloth a vivid counterpoint to the green mountainsides and their deep brown skin. It’s a compelling image, and I’ve taken many of them myself. And there’s nothing wrong with it. Indeed, such images reflect the incredible skill of women, a baby usually wrapped on their back, using their hands and body to subtly manipulate a backstrap loom to produce items of incredible beauty. (That the tourist trade has encouraged them to produce some stuff that’s not so beautiful is a different story.) Full disclosure: I’ve tried to use a backstrap loom, and it’s not a pretty sight, though it did push a group of women into extreme laughter. Fortunately there are no images of me going native. Yet we’ve all seen such images of Maya women weaving, and so capturing one more could seem to add little to the visual canon. Personally, I’d rather look for something else, something that doesn’t evoke a response of “Oh, I’ve seen that before.” To my rescue during this recent trip came a group of indigenous women in Tuixcajchis, a small Mam-speaking Maya village in Comitancillo. I had interviewed some of these women the day before, and their wisdom will show up in an article next year in response, the magazine of United Methodist Women. They had talked about the limits on their lives placed by everything from men to foreign mining corporations. 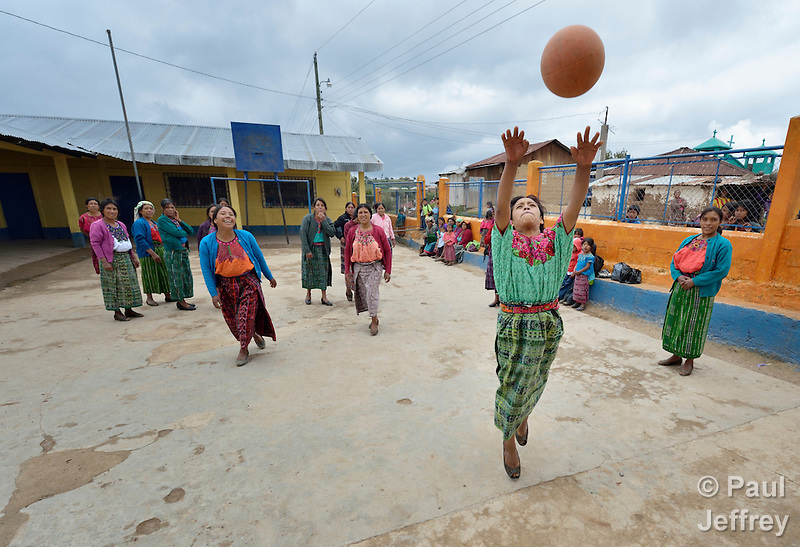 In discussing cultural restrictions, several women mentioned how they loved to play basketball, but had been told from an early age that it was not an appropriate game for girls and women. 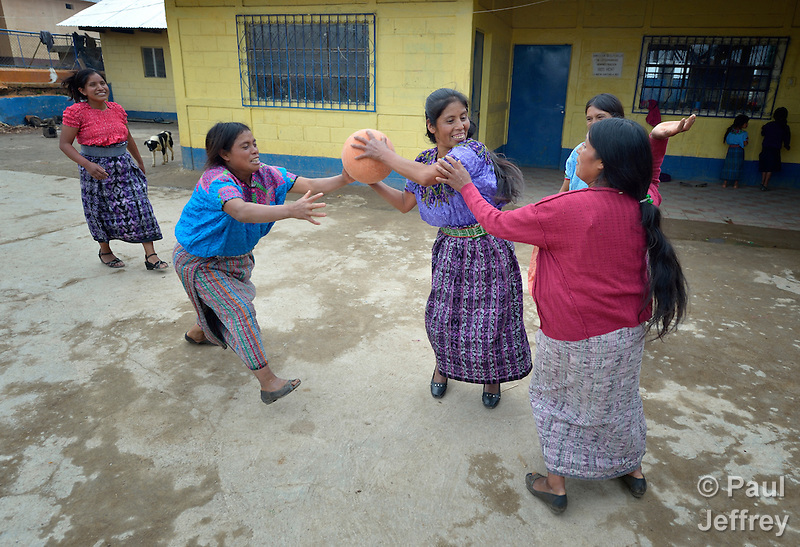 When I ran into some of the same women the next day (they were having a meeting in a municipal center next to a school where I was photographing a nutrition program with children), I casually mentioned (far be it from me to externally influence events) that the school had a basketball court . 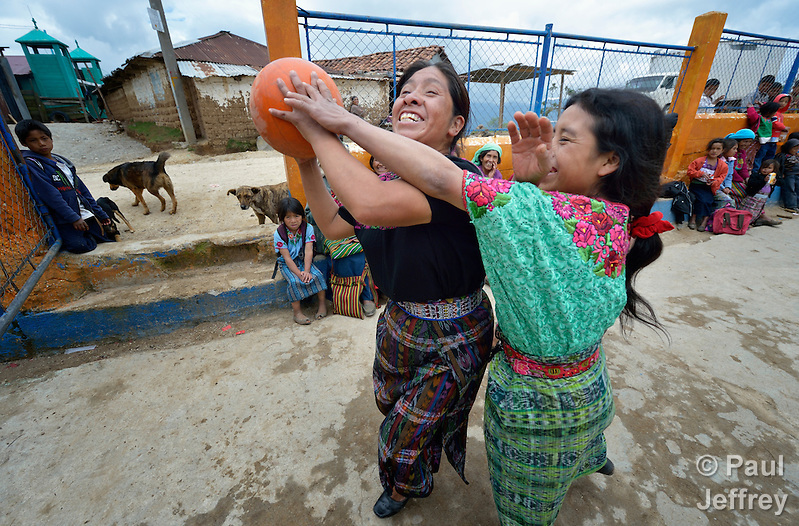 . . and they said, “Yes, let’s play basketball!” Well, I assume that’s what they said, because I don’t speak Mam. But they evidently thought it was a great excuse to end their meeting and go commandeer the schoolyard. And they played with an enthusiasm that rivals the Seahawks’ Legion of Boom. 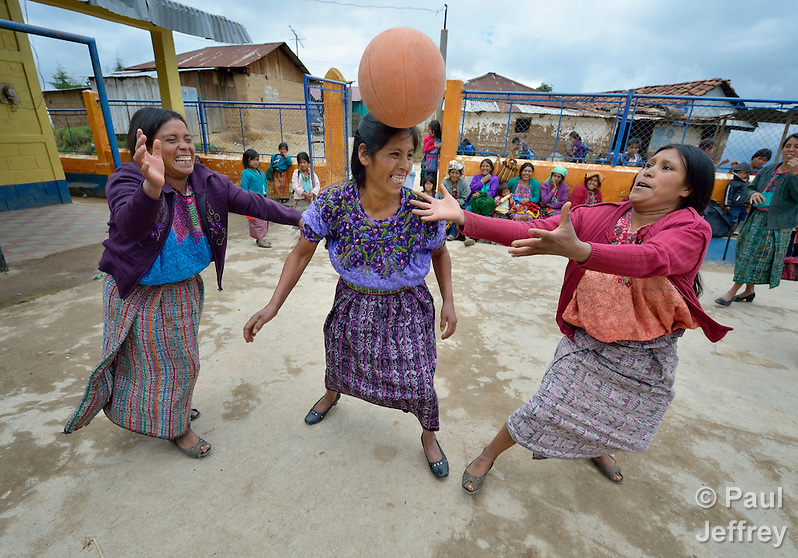 I liked capturing these images, and I enjoy looking at them, as they show strong women having fun, despite all the cultural messages that try to tell them otherwise. 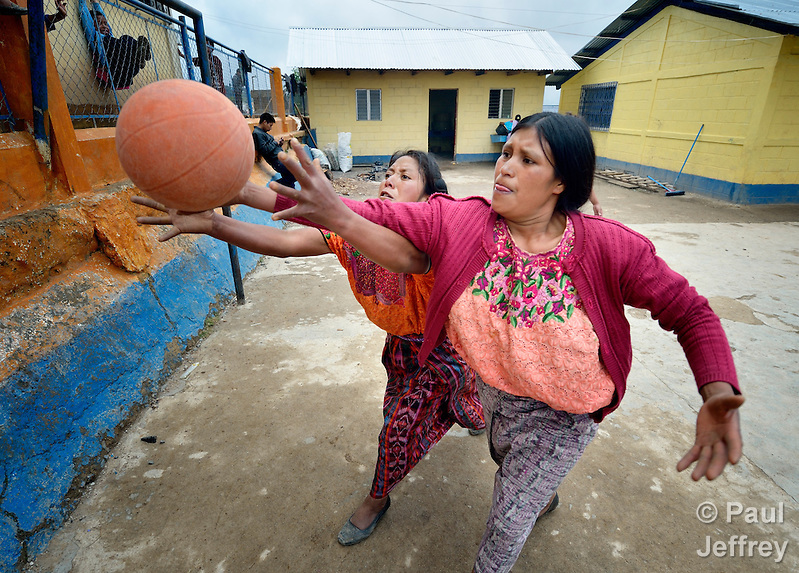 And precisely because we haven’t seen lots of photos of Maya women playing basketball, a viewer doesn’t respond initially with “Oh, I’ve seen that before.” Ultimately, that’s an important objective of any good photograph, to present something or someone in a new way so that the viewer has to pause and, if it’s a good day, rethink the world they live in. 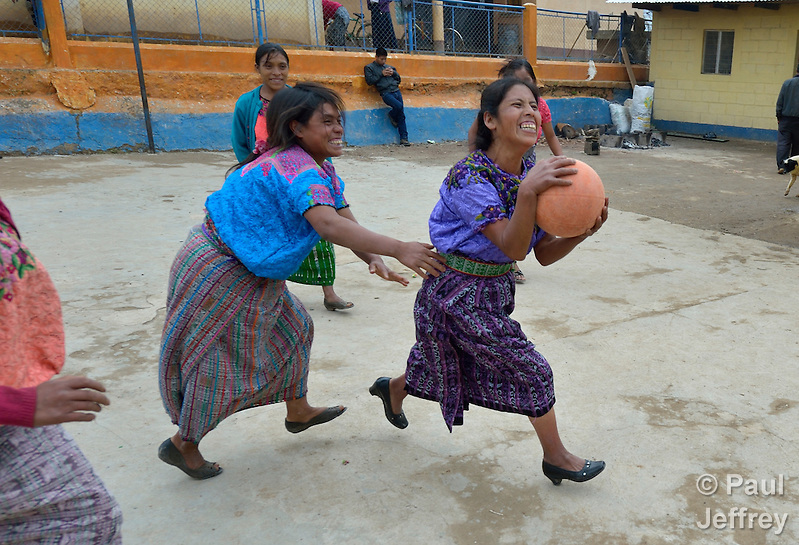 While we’re at it, young Maya girls can also play ball, with an enthusiasm (if not an understanding of the rules) similar to that of their mothers. After spending several days in the western highlands, I returned to Guatemala City, and the next day drove out to La Puya, a community northeast of the capital where for a couple of years local residents have defended their families and their environment against a proposed gold mine. They have confronted head on the corrupt national government that awarded the mining concession in violation of regulations requiring local communities to have a say in how their lands are used. The people in La Puya set up a blockade of the mine entrance, repeatedly staring down police and the Canadian-U.S. mine operators who couldn’t get their heavy equipment in past the protestors. Keeping the mine closed meant maintaining the protest 24 hours a day, and for months they had held off the police and giant bulldozers. It was a calm morning in La Puya, and we sat in the shade of a large tree near the entrance. Portions of that interview will also show up in response next year, but what sticks in my mind is the leadership of women in that struggle. Both the women and the men told me that the women’s leadership of the resistance had been a crucial factor in both the struggle’s nonviolent nature and its success to date. They agreed that standing up to police violence didn’t suit the local men very well, as they were likely to respond with violence themselves. The women, on the other hand, were more patient and many had dealt with violence from men for years, so they were more suitable to lead the movement and be in front when the police showed up. I came away from the interviews with that wonderful feeling that the people interviewed had just made my job easy by speaking wisely and articulately. And I was impressed by their determination to protect their families and their environment from the mine. Fortunately, James Rodriguez, a talented young Mexican photographer who lives in Guatemala, was able to get to the site. Here’s a link to his dramatic photos from the day, many of which show the courage of the women there. They are not passive objects of the tourist culture, but brave women standing up for themselves and their families. We can never see too many images like that. 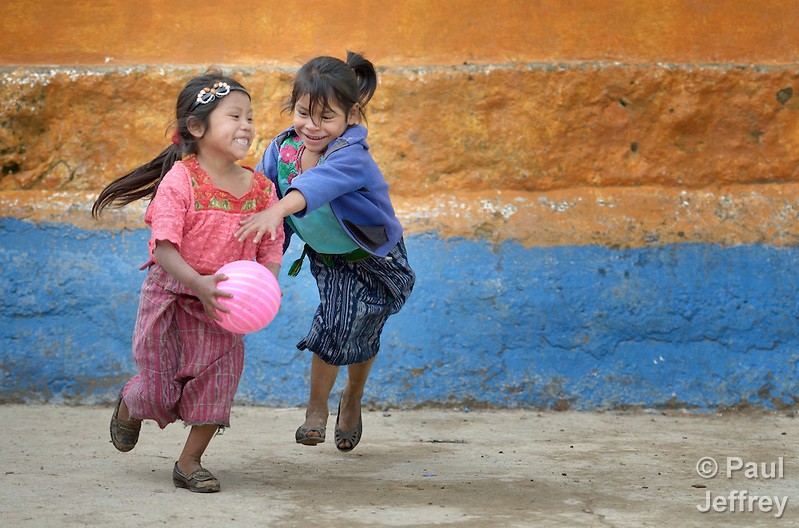 Here’s a gallery of my images from that trip to the western highlands of Guatemala. August 10, 2014 | Filed under Americas, Blog, Environment, Fun, Photography, Women.